"Disney's new Broadway musical ALADDIN sweeps you into a world filled with beauty, comedy and spectacle. Brought to theatrical life by a legendary creative team, Disney's new Broadway musical ALADDIN will sweep you into a world filled with beauty, comedy and breath-taking spectacle. 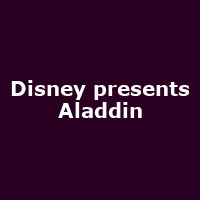 Featuring the timeless songs from the classic film including A Whole New World, Friend Like Me and Arabian Nights along with new music written for the production."